Lawmakers talked a big game about improving transparency this session, but when push came to shove, they did next to nothing to advance it. 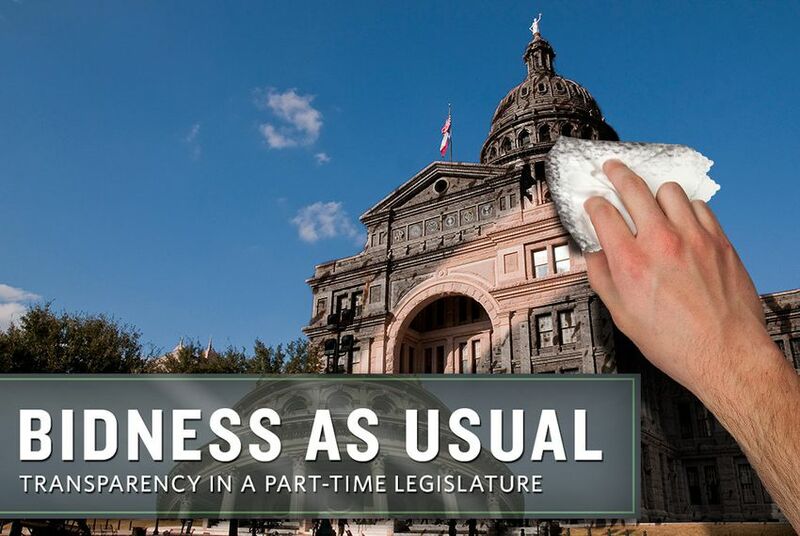 This is one in a series of occasional stories about ethics and transparency in the part-time Texas Legislature. Key proposals never even got close, like bills to strengthen reporting of lawmakers’ financial interests, prevent the quick revolving door that sends former legislators into the lobby, and stop the practice of allowing elected officials to draw down both their state salary and their pension. Others got within spitting distance. As of Friday morning, a reform bill for the Texas Ethics Commission still carried amendments the House passed by wide margins to put lawmakers’ financial disclosure forms online, to require groups to report spending on a speaker’s race and to force lawmakers to disclose their contracts with government entities. But House and Senate negotiators stripped those off in conference committee — even while they added provisions to keep more information, like their home addresses, private. Gov. Rick Perry hammered the nail into the coffin with his veto of Senate Bill 346, a measure that would’ve forced politically active nonprofits to disclose their donors. Supporters hoped it would expose the anonymous donors to groups like Texans for Fiscal Responsibility, an organization run by conservative activist Michael Quinn Sullivan that has targeted the state’s establishment Republicans with email blasts and scoreboards. In his veto, Perry argued that the measure would’ve had a chilling effect on donors to nonprofits — from Tea Party and civil rights groups to anti-abortion advocates — organized under section 501(c)(4) of the tax code. A couple of smaller-scale ethics advances are hanging to the omnibus Ethics Commission bill awaiting Perry’s signature, including a provision to require railroad commissioners to resign if they run for another office and another that would force those who post political ads online to disclose who’s paying for them. Lawmakers who become lobbyists would also have to wait two years before donating their leftover cash to sitting members by way of campaign contributions. Lawmakers have also passed a separate measure that would call for an interim study — a common maneuver to kick controversial reform measures down the road — on the state’s ethics laws and reporting requirements. While lawmakers took some steps forward this session, “the Legislature still has miles to go to end the ethics abuses,” said Tom “Smitty” Smith, the Texas director for the consumer watchdog group Public Citizen.